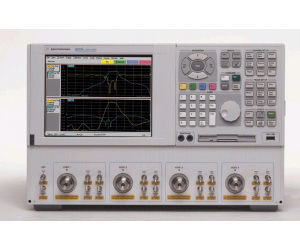 The Agilent 4-port PNA-L vector network analyzer is a member of the PNA series network analyzer platform and provides the best combination of speed and accuracy for measuring multiport and balanced components such as filters, duplexers and RF modules up to 20 GHz. The 4-port PNA-L automatic port extension feature automatically measures and corrects for fixtures, making measurements of in-fixture devices simple and accurate. This new feature also corrects for a fixture insertion loss to further improve accuracy. In addition, the Agilent optional Electronic Calibration (ECal) modules enable engineers to perform fast, repeatable and highly accurate calibrations. With ECal, full two-, three-, and four-port calibration can be performed up to 30 times faster than mechanical calibration.